THE WORD “INDUCTION” has a whole bunch of meanings: Merriam-Webster starts with “the act or process of inducting (as into office),” which is sort of a definitional cop-out: What’s “inducting”? Another M-W citation is “a preface, prologue, or introductory scene especially of an early English play.” Interesting, but bordering on the theatrically obscure. 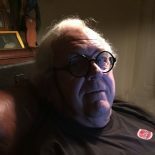 There’s also “the act of bringing forward or adducing something (such as facts or particulars).” This one includes electrical induction of magnetized bodies, the biologic fate of embryonic cells, and even the perhaps more familiar internal-combustion idea of fuel and air entering on the first of a four-stroke process. M-W also cites “inference of a generalized conclusion from particular instances—compare DEDUCTION sense 2a.” What a good topic for another day! Which did Sherlock Holmes employ? Deduction? Induction? Both? Here’s an example of mathematical induction, offered by comet.lehman.cuny.edu: Prove that 1+2+…+n = n(n+1)/2. For instance, 1+2+…+8 = 8×9/2= 72/2 = 36. The First Domino. Verify the equation for n=1: Is 1 equal to [1x (1+1)]/2? Yep. The first domino is standing, ready to initiate the logic. 1+2+…+(k + 1) = (1+2+…+k)+(k+1) = [k(k+1)/2] + (k+1), this first bracketed part by the Induction Hypothesis. With some algebraic regrouping, = [k(k+1)+2(k+1)]/2 = [(k+2)(k+1)]/2, by factoring the (k+1)s, =[(k+1)(k+2)]/2, by the commutative nature of multiplication. Thus, assuming the equation works for k implies it also works for k+1. 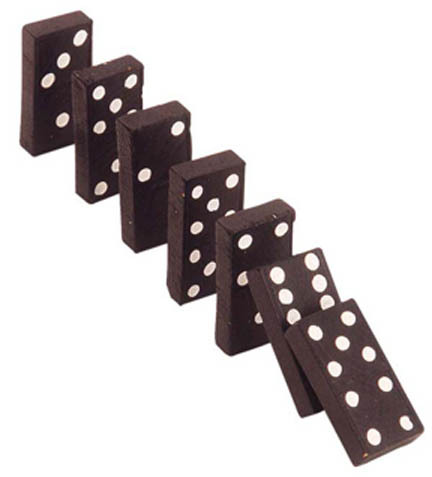 Loosely, the first domino is tipped, and the carefully aligned others all tumble. Gauss’s Genius. There’s a charming story about the young Carl Friedrich Gauss, destined to be known as Princeps mathematicorum, loosely (and incorrectly) the Prince of Mathematicians. 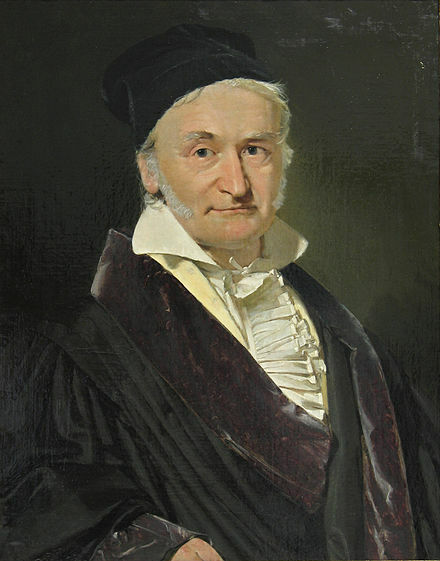 Carl Friedrich Gauss, 1777–1855, German mathematician and physicist. In fact, Princeps mathematicorum is Latin for “the foremost of mathematicians. Image from The National Council of Teachers of Mathematics. Gauss recognized he had 50 pairs of numbers, each pair adding to 101. Thus, 50 x 101, or 5050. Easy-peasy. I figured this one out years ago myself, somewhat sure that I wasn’t the first to do so. Also summing between two numbers, say n and m would be m*(m+1)/2-n*(n-1)/2. Example sum between 4 and 11: 11*12/2-4*3/2 = 66-6 = 60. This entry was posted on March 19, 2019 by simanaitissays in Sci-Tech and tagged "Merriam-Webster Online" dictionary, 1+2+...+100=5050, Carl Friedrich Gauss, induction various meanings in electricity biology engineering, mathematical induction = dominoes of logic, The National Council of Teachers of Mathematics.